Children are a product of their unique worlds. They learn from what they see, hear, and experience. They learn to act acceptably or unacceptably by processes over which they exert little control. They are responsible, not blameworthy. The Avondale Youth Center shall prepare youth and families for reunification by providing a therapeutic environment and appropriate professional services which enable responsible growth. 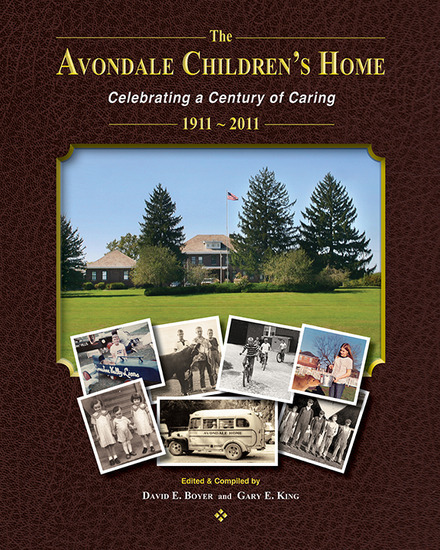 The Avondale Children's Home - Celebrating a Century of Caring - Edited & Compiled by David E. Boyer and Gary E. King was released and can be purchased through Amazon.com. The Avondale Youth Center (AYC) is a co-ed, residential therapeutic center with a twenty-two bed capacity, operated by the Muskingum County Children Services Board and licensed by Ohio Department of Job and Family Services. Established in 1911, the facility provides a comprehensive therapeutic intervention program to youth who have been abused/neglected or abandoned. These youth often times have been diagnosed with mental health disorders, emotional problems, and authority issues. Adolescents must be between the ages of ten and eighteen and reside in Muskingum County. Youth are placed at AYC when the need has been indicated for a highly structured, therapeutic living situation. The goal of the AYC comprehensive array of services is to design an individualized therapeutic intervention program, stabilize the child, and ultimately return the child to a stable home environment. A professionally trained and understanding staff, with an average of ten years of experience, will guide each adolescent to a new destiny. Several mechanisms combine to accomplish the goal of AYC. Staff provide the required structure and a safe atmosphere for a child to build self-esteem and develop healthy independent decision-making skills. Multiple adjunct mental health services provide specialized counseling. A social worker is assigned to coordinate all services. A family stability worker is assigned to work with the family in the home in order to develop an enhanced comprehensive approach. All aspects of the functioning of AYC are programmed for the benefit of the child. During the first thirty days after placement, the child is assigned a staff "sponsor" who, in combination with the child, parents, social worker, and significant others, design a service plan. This plan (with revisions every ninety days) provides the foundation for treatment. It includes an overview of the circumstances leading to placement, diagnosis, treatment goals, and specific activities to accomplish these goals. The plan is revised to reflect progress, goal changes, and additional therapeutically significant information. Families and/or significant others participate in weekly therapy which focuses on the strengths of the family system with the purpose of returning the child home. The purpose of AYC, stabilizing and returning a youth to a permanent stable home, is usually achieved within four to five months. However, length of stay is individualized and varies considerably. Much depends on the child's ability to cope, parental involvement, and placement possibilities. As the needs of the community have changed over the years since 1911, Avondale Youth Center has revised its purpose and goals to accommodate those needs. AYC will continue to meet the needs of the community by providing outstanding, accountable services to the community's children in need.